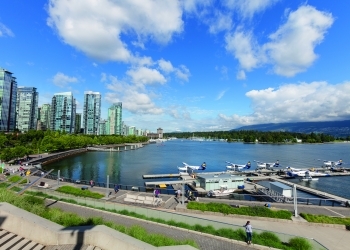 Consistenly rated as one of the top three places in the world to live, Vancouver is a stunning, friendly and charming West Coast city. It offers culture, recreation, history, adventure, shopping and entertainment, against the beautiful backdrop of the Pacific Ocean and Coastal Mountain range, which are perfect for outdoor activities. Hosts serve three meals daily: breakfast, a packed lunch and dinner. They include the four basic food groups: protein (meat, fish, eggs), carbohydrates (bread, pasta, rice), dairy products (milk, cheese, etc), fruit and vegetables. Students must have proof of adequate health, accident and travel insurance while attending any of our programmes. This must be acquired prior to their arrival. Students should always travel to Canada with a proof of insurance document. Insurance can be either private or booked through EC. Further information is provided on request. All students will have access to a phone and will be allowed to receive calls. If students would like to make international phone calls, they will be asked to purchase a calling card. Linen and towels are provided by the homestay provider and are cleaned weekly. Laundry facilities are available to the student at their homestay. The program begins on Monday with orientation and placementent tests. Lessons are engaging and designed especially for young learners. Teachers aim to satisfy any interest, with a focus on communication to boost students' confidence when using English in practical situations. Conversation classes help to ensure that students improve their language skills as much as possible. The course will help improve English language skills by focusing on the key areas: reading, writing, speaking and listening. A strong focus is placed on speech and using the language confidently and fluently. Our dedicated and professional teaching staff will provide feedback and support and help students build confidence to speak English. Free Wi-Fi is available. Wireless internet is password protected. Attendance in class is required. If students are sick they must notify the school immediately. All classes begin promptly at 9am. English is the only language spoken at school and in the classes. Students must respect their fellow students' cultural and ethnic background. Intolerance, harassment or discrimination is not tolerated. Food and drink is not permitted in the classroom or in the computer room. Students will be required to pay for any damages. On the first day, all academic staff places students in the relevant group for their ability based on the placement test. In the afternoon, students will be given an orientation tour. Students are to bring their passport and their airline ticket to school on the first day. All students must attend classes on a daily basis unless they are genuinely indisposed (due to illness, for example). Educational materials are provided. Students should bring their own notepaper and pens. The legal drinking age in Vancouver is 19 years. It is illegal for all students attending this course to consume alcohol, have someone buy alcohol on their behalf, or visit bars/clubs. Using drugs, being under the influence of drugs or possessing drugs is illegal. Under no circumstances should students use, possess or be under the influence of drugs. The legal age to buy tobacco is 19 years. It is illegal to buy tobacco or have someone buy tobacco on the student's behalf if they are under the legal smoking age. Failure to follow any of the above rules will result in immediate expulsion from the programme with no refund. Students' parents will be notified immediately and the student will be sent home at their own expense. Depending on the severity of the situation, breaking any of the above rules may result in a monetary fine, arrest, jail sentence or deportation by the Canadian police. Students must attend all lessons and organised activities in order to receive their End of Course Certificate. Being in possession of false identification is an act of fraud and is illegal in Canada. Parents/guardians must sign the Young Student Waiver giving emergency details, and their consent and permission for their child to receive medical treatment and attend activities. Extra nights may be available at an additional fee, all requests are subject to availability. Students are asked to check with the Canadian embassy whether they require a visa to enter Canada before they submit their application. Further details will be provided on request. Attendance to all pre-paid and afternoon activities is mandatory. Punctuality for all activities is also mandatory. If you are late for an activity that is time dependent, the activity will continue as scheduled. No refund will be issued for missed activities. Students are to respect their activity leaders, fellow students and their surroundings. Students will be taken outside the Learning Centre for their activity, therefore, it is essential that students stay with the group at all times and follow all activity instructions carefully. Supervision is provided during all activities.